You can cancel your subscription at any time by going to the app section "Billing Information" and then do "Request Cancellation". 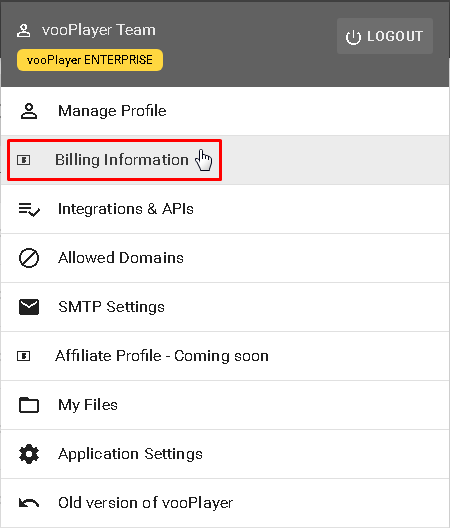 These options are available when you log in to your vooPlayer account and click on your username at the top right corner of your screen. All your subscriptions and licenses will be listed here. In this example, a user is subscribed for the ENTERPRISE license and on the first look it looks like he is subscribed to two same products. That is not true, since it is a Monthly subscription, so it is renewed every month. In this particular case, it is enough to cancel only one subscription. If you previously had the PRO license you will be reverted back to this license, like in this example. Kindly note that the ENTERPRISE license is the only one available for purchasing, the PRO license can only be inherited from the old v3 version.